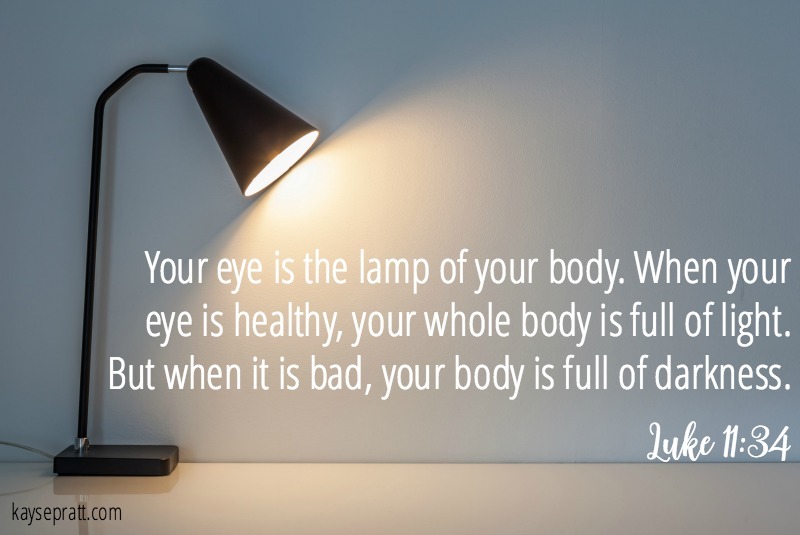 Your eye is the lamp of your body. When your eye is healthy, your whole body is full of light. But when it is bad, your body is full of darkness. You’ve heard the phrase, “If momma ain’t happy, ain’t nobody happy,” right? Well, there’s a lot of truth there. At least in my house. As moms, we have this great, impossible responsibility of setting the tone of our home. Our attitude, our demeanor, our mood – these things can either make or break our days. And the one thing that determines all of the above is our perspective. Luke says that when your eye is healthy, your whole body is full of light. I think it’s fair to say that our eye is our perspective – the way in which we view things. I can focus on the hard things, and so often I do. Right now we’ve got quite a few hard things happening, and I’m struggling to manage it all. But even when life is hard, we get a choice every single day. We get to choose what to focus on, we get to decide what shapes our perspective. Every day, we get a chance to bring either light or darkness into our homes. What will our choice be today? Will we focus on the failures of yesterday? Will we rant over spilled milk and shoes on the wrong feet and kids who refuse to listen? Will we see only what is in front of our eyes, and lose both our patience and our perspective? Or will we focus on the new mercies found each morning? Will we praise the One who supplies the milk and the shoes and gives us the opportunity to raise up these children? Will we beg God for eyes that can see the things that matter eternally, and act accordingly? Our perspective each day makes a difference. It does. It teaches our kids what is important to us. It teaches them what to focus on. It impacts their understanding of who God is. And, if we’re honest, our perspective makes a difference in our own lives. It trains us to know what is important as well. It teaches us what to focus on, and it impacts our understanding of who God is. We’re not going to get this right all the time, we’re just not. But we can continually turn to the Word of God to speak truth into our lives and shape our attitudes, especially as we serve our husbands and lead our children. As we get up each morning this week, let’s ask ourselves a question. Are we bringing Jesus into our home, or are we bringing the troubles of this world? He’s already overcome all those troubles, so let’s focus on letting His light set the tone of our homes and our hearts. How does your perspective affect the way you interact with your kids? How have you seen this played out this week already? 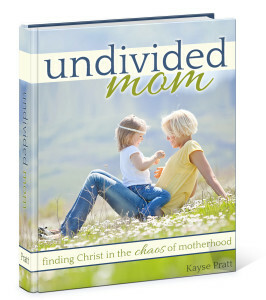 This post is an excerpt from our 14-day devotional for moms, Undivided Mom. It’s on sale this week in our brand new shop. If you like what you read here, and you’d like to read more, pop on over and get yourself a copy! “Will we beg God for eyes that can see the things that matter eternally, and act accordingly?” I need this reminder everyday! Thank you so much for this! SO SO GOOD. Thank you for that reminder!